Calafia Beach Pundit: What happened to all the profits? In the six years ending June, 2014 (a period which encompasses the worst of the 2008 financial crisis and the entirety of the recovery to date), the after-tax profits of U.S. corporations totaled about $8.9 trillion. This marked an all-time record for corporate profits, both nominally and relative to GDP: profits averaged about 9.4% of GDP per year. By comparison, over the past 55 years, after-tax corporate profits have averaged only about 6.4% of GDP per year. Over the same six-year period, the federal government borrowed about $7.4 trillion from the U.S. and global capital markets to fund its deficit. 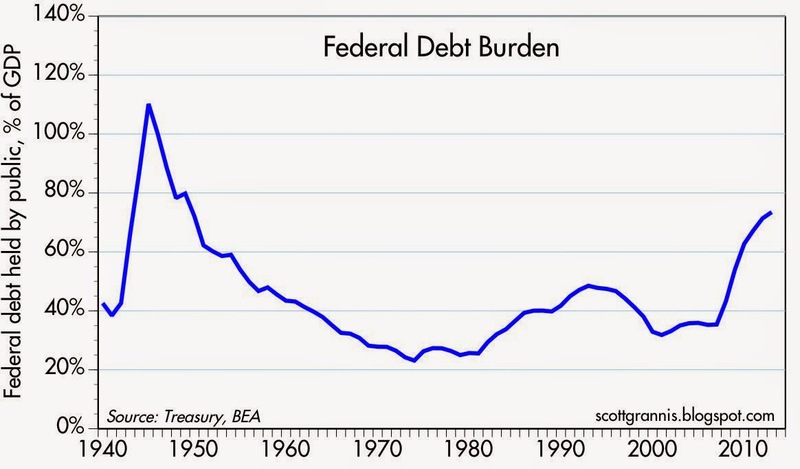 This resulted in a doubling of the federal debt burden, from 36% of GDP in mid-2008 to about 73% today. Despite assurances from politicians and most economists of Keynesian persuasion, not only did the biggest and most rapid increase in our federal debt burden since WW II fail to boost the economy, it coincided with the weakest recovery in history—growth of only 2.2% per year on average. (I was among those who warned in late 2008 that this would happen, and quite a few times over the years following.) This is not a problem of not spending enough, it is a failure of ideology, and arguably the most expensive such failure in the history of the world. Here's the failure in a nutshell: The government can't stimulate the economy by borrowing from Peter and sending a check to Paul, because that doesn't create any new demand—it's like taking a bucket of water from one end of the pool and pouring it into the other end; the level of the water doesn't change. And the government can't stimulate the economy by spending more, because the government is notoriously inefficient (not to mention the fraud, waste, and incompetence that surround most major public initiatives); the private sector is far more likely to spend its money wisely and productively than the government is. Growth only happens when an economy produces more from a given amount of resources—when productivity rises. And productivity only rises when people work more, smarter, and more efficiently, and that takes hard work and risk. You can't just dial up productivity, you have to work for it. We can't "spend our way to prosperity," as the late and great Jude Wanniski told us. The past six years in effect have been a laboratory experiment to determine whether Keynesian economic theory is valid. The result? Keynesian economic theory is (or should be) officially dead. It doesn't work. Government can't boost the economy by borrowing or spending more money. Politicians will be unhappy to hear this, of course, since they would prefer that we think they can dispense growth and prosperity on demand. Those who insist in perpetrating this myth should be voted out of office. Here's my interpretation of what really happened in a nutshell: the private sector generated $8.9 trillion of profits in the past six years, and the federal government borrowed 83% of those profits to fund a massive increase in transfer payments, income redistribution, bailouts, subsidies, and a modest increase in infrastructure spending (as I noted here, only 8% of the 2009 American Recovery and Reinvestment Act went to transportation and infrastructure). Update: we recently learned that $5 billion was spent by the USDA on "questionable or unsupported costs." Now of course many will object to my grossly simplified explanation of what happened. It's true that a good portion of U.S. corporate profits still reside overseas—they haven't been repatriated because companies are loathe to pay the onerous 35% corporate income tax on profits that have already been taxed at their point of origin. But those profits are nevertheless made available to the global capital markets, and money is quite fungible. A trillion dollars of unrepatriated corporate profits can easily find its way back to the U.S., where it can end up being invested in Treasuries owned by a foreign entity. It might just as easily end up being borrowed by companies who want to expand their operations. But no matter how you look at it, corporate profits—wherever they are earned, and wherever they end up—are a source of funds for capital markets, and Treasury borrowings are one way those funds are put to work (or squandered, if you will). It doesn't matter if corporations didn't directly purchase all the bonds that Treasury sold: the net result is that $8.9 trillion of corporate profits were dumped into the capital markets over a six-year period, and the Treasury borrowed $7.4 trillion from those same capital markets over the same period. Record profits and record (post-War) government borrowing, all to no avail. Bailouts and the 2009 ARRA "stimulus" bill resulted in a significant boost to federal spending from mid-2008 to mid-2009. At the same time, the devastating effect of the Great Recession resulted in a predictable collapse of revenues as jobs were lost and profits shrunk. 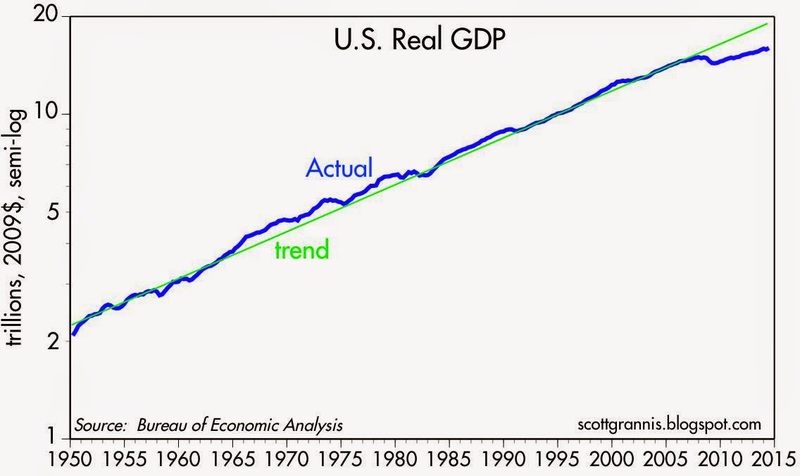 The gap between the red and blue lines was funded by the issuance of about $7.4 trillion of Treasuries. The true burden of federal borrowing can only be appreciated by comparing how much the government owes relative to the size of the economy, because it's the economy that is the ultimate source of the funds to repay the debt. A $7.4 trillion increase in federal borrowing from mid-2008 to mid-2014 resulted in a record, post-war doubling of the federal debt burden in just six years, from 36% to 73% of GDP. Despite an unprecedented increase in fiscal "stimulus," the economy has grown at only slightly more than 2% per year on average during the current expansion. This is by far the weakest recovery ever. The conclusion should be obvious: at the very least, fiscal stimulus didn't help, and it's not a stretch to think it actually hurt the economy. 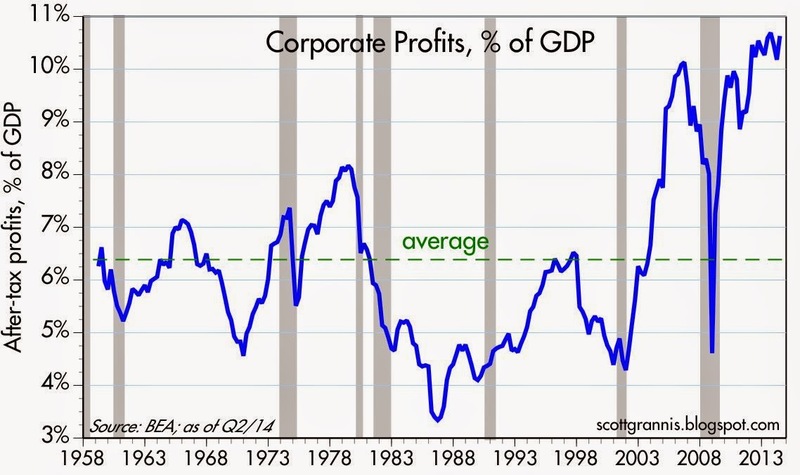 Although this has been the weakest recovery ever, corporate profits have never been stronger. That (the unprecedented sluggishness of the economy despite the unprecedented growth of corporate profits) most likely can be explained by the fact that federal government borrowing consumed almost all of the profits; corporations generated tons of economic resources (i.e., capital) that the government then squandered. When the government commandeers a huge portion of the fruits of the private sector's labor, much money is wasted through inefficiencies, bureaucratic costs, waste, fraud, and the creation of perverse incentives (e.g., taking/borrowing from the most productive members and giving/lending to the least productive). The result is meager growth. 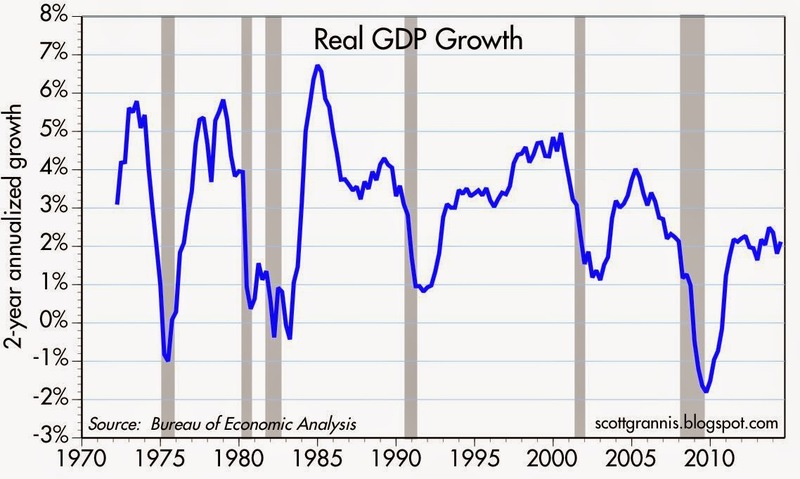 This is the first recovery in which real growth has not rebounded, within a few years, to its long-term trend. Thus there is arguably a "shortfall" of growth that amounts to $2 trillion dollars or so in lost income each year. We are paying a huge price for this failed experiment in government "stimulus." Scott, I get all of what you say in today's blog except the explanation of why corporate profits are so large, i.e. "explained by the fact that federal government borrowing consumed almost all of the profits". How does government borrowing increase corporate profits? Thanks for your excellent blogs. Government borrowing didn't increase corporate profits. Corporate profits were generated by strong corporate performance: strong sales, an expanding global marketplace, innovative products, rigorous cost controls, etc. Normally you would think that strong corporate profits would lead to strong investment (expanding plant and equipment, a lot more hiring, etc.) and thus a strong economy. But that hasn't happened, and I think a good part of the explanation for why it hasn't happened is that the government has consumed and wasted a significant amount of the resources (i.e., capital) that corporations have generated. Deficits do matter! I like a balanced federal budget. Some exception can be made for a capital budget, bridge building and airports and so forth. I recommend a 20 cut in all federal departments, excepting Social Security and Medicare. I look at what you describe as the structural problem with the US economy. The same problem exists in Europe and Japan (although Japan does not have the welfare state, it has an especially bad demographics problem). The growing US structural problems also include failing public schools and growing race divides. This is why I believe any improvements in the economy are cyclical as we head to the end of this cycle and move to a Japanese style lost decade or two. Where is the change going to come from? The Republicans are now center-left and Democrats are far-left. If we are lucky we become Japan and not Argentina. Don't overlook the good news. 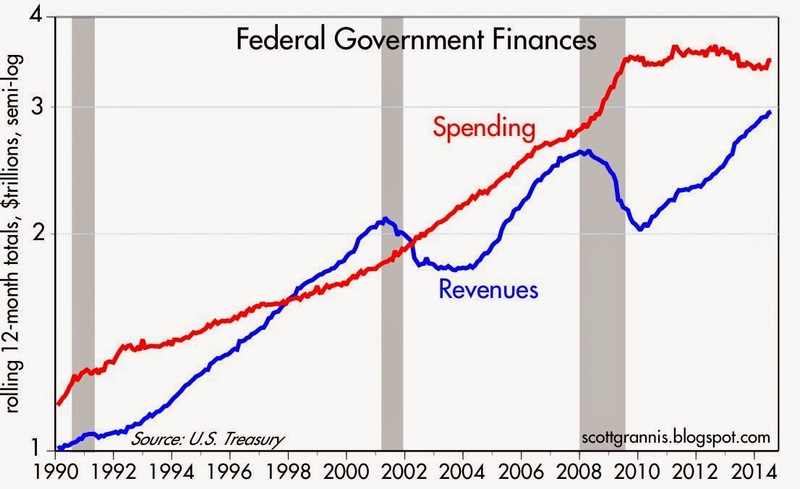 Federal spending growth has been zero for years, and the annual deficit has collapsed by two-thirds. Meanwhile corporate profits continue to be strong. The government is wasting a lot less of GDP now, so growth could begin to pick up. This thread should be posted on every economic site on the Internet! Well done, Mr Grannis, well done indeed. If deficit spending is financed with new money then corporate profits are increased. This is because the new money spent by the central government ends up eventually as business profits less any household savings along the way. Profits are savings. If government spending is financed from other peoples money then there is not an increase in corporate profits. This is because the money spend came from someone who now cannot spend it. Hans, I have emailed a link to all my friends. This is a lesson in fungibility. Fungibility is a hard concept to comprehend for a lot of non-accounting and finance people. It is fundamental to the post here. Economics is a lazy profession. It is easy. Economists just have to pontificate. Financial managers of corporations have serious accountability. I wish econometrics would take on the mantel of macro cash flow in the economy. It would elevate the understanding and really predict the future (without consideration of how people may change to current conditions). Thanks Scott for it explains why the stock market keeps going up when it is expected by many to fall badly. Can cooperate profits disconnect from the slow growth economy? Is that the new normal? If government borrowing is so wasteful why are investors willing to buy so much US debt ??? Don't they know they can get better returns investing in the private sector ? Nobody is forcing them. I don't buy any of your arguments. "If government borrowing is so wasteful why are investors willing to buy so much US debt ??? Don't they know they can get better returns investing in the private sector ? Nobody is forcing them. I don't buy any of your arguments." this makes absolutely NO sense. investors buy US debt because it is the safest debt in the world backed by the unlimited taxing power of US government. scott, your BEST piece ever. I especially like hoe you point out that keynsian economics is dead. RIP. Furthermore, since most of the deficit since 2008 has been financed by money creation, the private sector was not crowded out on the capital markets. The reasons for low inflation remains a puzzle, but is probably do to high excess capicity, private balance sheets obliterated by the Great Recesion and thus an inordinate demand for savings, and lack of credit growth (demand for loans is low and just above its pre-recession peak. Thus, the banks could use all those excess reserves generated by QE to expand the money supply.) In other words, when you have a debt backed money system, new money can only be created by new debt. Somebody actually has to borrow all those excess reserves to increase the money supply in meaningful terms (gross simplication, but generally correct) When an economy is coming of a decade of over leverage, both demand and capacity to take on new debt was at historic lows. Deficits DO increase corporate profits! Somebody has to earn the money spent by the Federal Government! When it borrows rather than taxes, the spending it financed, so the bond sits on an investors balance sheet as an asset, and the cash spent into the economy is the private sector's asset. Some of the deficit spending with be earned directly or indirectly by corporations, resulting in higher corporate profits. In sum, this article is nonsense. Mr Constable, I have bookmarked this thread because of it's significants and it's conclusion. I believe, Mr Grannis, has made objective points, which can not be refused. Perhaps we can call it Grannis' efficiency of money. I am not sure if JMK would have approved the course of governmental unit intervention, over the past six years but certainly he would have endorsed a portion of it. We are less than 90 days from the mid-elections; hopeful the general public has awaken from it's slumber and realized that Socshevikism does not bring any amount of prosperity. This election, followed by 2016 are indeed seminal for America's future. Scott, I'm interested to hear your thoughts on the source of profits as explained by the Kalecki equation. Would you mind posting the link for all? Scott: In your response to EEE, you replied,"...I think a good part of the explanation for why it hasn't happened is that the government has consumed and wasted a significant amount of the resources (ie capital) that corporations have generated." Could you explain this a bit further? Is this a crowding out effect? I ask because I would think that corporations get to keep all of the net profits they make. With the exception of foreign profits trapped overseas, it would seem that despite the size of any govt deficits corporations are free to spend their retained earnings on anything they want, including more capex. What am I missing? I regret that I'm not really understanding your numbers. If, as per your post, corporate profits are 11% of GDP and corporate taxes are 35%, wouldn't it follow that the government can spend 3.85% (11 *0.53)of GDP per year from corporate taxes? This wouldn't nearly account for the increase in debt. Further, the 11% and 35% numbers are absolute highs. A better approximation would be 9% and 20% (more in line with actual corporate tax rate). Chirs: After-tax corporate profits are currently running at an annual rate of 10.6% of GDP ($1.8 trillion). The federal government collected $304 billion in corporate taxes in the 12 months ended July 2014. Neither has much to do with the increase in federal debt. Copper prices are back down to 2005 levels. Basically copper prices spiked 2002-2005, then sagged in the Great Recession, then spiked to new highs in 2011, before falling back to 2005 levels. Been squishy now for three years. Seems to me many commodities got gamed in the great commodities inflation of 2000-2008. But, the market is the market. That brought on more supply, and cut demand. Now the word is glut in many commodities markets--oil is soft even with so many major producers in wars, such as Iran, Iraq and Russia. And other producers corrupt, such as gong-show Venezuela, Mexico or Nigeria. Our "pals" the Saudis limit production. It would be hard to think of a more crappy set of producers, and still oil is falling. I think this commodities softness is a minor plus for the global economy. I also think the connection between commodities prices and monetary policy is more tenuous than ever. I expect commodities prices to be squishy for years. Meanwhile, check out aluminum prices. That stuff just gets cheaper and cheaper over the decades. Bullish sentiment soared through the "concerning" 50% mark in one week!! Aother markets are bullish as well - see the links below. "The MSCI All-Country World Index jumped 2 percent for the month and the Standard & Poor’s 500 Index surged 3.8 percent, giving both gauges the best performance since February. Ten-year Treasury yields dropped 21 basis points, the most since January, while rates on similar-maturity bonds from Italy to Spain and Germany touched record lows. The MSCI Emerging Markets Index capped its longest streak of monthly gains since 2005. Volatility eased despite global conflicts, as the VIX plunged 29 percent, the biggest drop in more than two years. More than $1 trillion was added to the value of global equities in August, sending it to a record $66.2 trillion. A Ferrari 250 GTO Berlinetta sold for $38.1 million in California, setting a record for a car sold at auction globally. Last night Christie’s saw the highest auction total ever, as the house took in $744.9 million with premiums on an evening that saw new records for Lucas Samaras, Joseph Cornell, Alexander Calder, Robert Gober, Salvatore Scarpitta, Barnett Newman, Martin Puryear, Frank Stella, Robert Mangold and Joan Mitchell, whose 1960 untitled painting set a new record for any female artist at $11.9 million. Because there can never be enough data to explain New York City's real estate market, Crain's has come up with a slew of interactive charts and graphs that encapsulate the crazy-booming-upwards situation right now. Above, one of the most important takeaways: in the second quarter of this year, the median purchase price in Manhattan topped its 2008 peak. Liquidity seems to be plentiful. "Last year, two Manhattan condominiums sold for over $90 million and a Francis Bacon painting went for $142.4 million. Now comes the $38.1 million car. While the Ferraris are rare — just 32 were built by hand between 1962 and 1964 — the price for the 250 GTO was hardly the only record during this month’s annual week of prominent car auctions on the Monterey Peninsula....At the Bonhams Quail Lodge auction, nine Ferrari models set records, as did a Rolls-Royce once owned by Elvis Presley, and several Maseratis. Even a 1962 Austin Mini sold for a record $181,500. The week’s sales total hit $400 million, a 28 percent increase from a year ago. Mr. Hagerty is chief executive of Hagerty Insurance, which specializes in insuring collectible cars and produces a price index....Hagerty’s Blue Chip Index of 25 classic cars rose 34.5 percent over the last year, far outpacing major stock and bond averages. Where is there FEAR in markets? Where is there VALUE? Nothing - including bonds - are cheap anywhere. I wonder, though, about measuring national debt against GDP rather than against some measure of assets, such as accumulated household wealth, which is, I think, about seventy trillion. I wonder if it would be fair to say that we have taken about a tenth of all our savings and spent it. We are ten percent poorer than before. Many Keynesians try to refute arguments regarding abysmal GDP growth, such as yours appearing in this post, by stating something along the lines of: It was the worst financial crisis ever and hence the 2% GDP growth is understandable. Take a gander at 18:30 to 19:41 of the 04/11/2013 lecture by John B. Taylor at Duke University. Taylor filtered through historical data of recessions and pulled out only recessions caused by a financial crisis. Eight such recessions exist stretching back to 1882. Of the eight quarters of expansion after the financial crisis induced recession officially ended, this expansion is the very worst on record. "Where is there FEAR in markets? Where is there VALUE? Nothing - including bonds - are cheap anywhere"
municipal bonds RELATIVE to treasuries are a STEAL and very likely to out perform for the foreseeable future. It is C-suite greed that is going to destroy America, not federal spending. amritsari: several problems with your facts. The article you cite references profits from 2003 to 2012, whereas I reference profits from 2008 to 2014. I don't think anyone knows the share of profits in the latter period that was devoted to share buybacks, but it doesn't matter. Share buybacks don't involve wasteful activities, and they don't necessarily take money out of the capital markets. They return money to shareholders who prefer money today instead of in the future. They are undertaken only if an investment in company stock represents the best use of shareholders' money (i.e., if the stock appears grossly undervalued). The buybacks and higher stock prices benefit not just corporate executives but also a huge share of the population via mutual fund holdings, direct share holdings, retirement accounts and pension accounts. Stock buybacks don't take money out of the capital markets, but government borrowing and spending does. Scott: I fully see how govt borrowing and spending takes money out of financial markets. That is, with lower levels of govt borrowing and spending, we'd see higher levels of money in the capital markets. That's pretty straight forward. But given the levels of govt borrowing and spending as they've been the last few years, it still doesn't explain (to me) why corporate capex has been as moribund as it's been. Yes, yes, I know it's higher than it was a few years ago; I also know it's recently accelerated somewhat. But with the level of profits as they've been the last few years, capex spending should be significantly higher, even with the actual levels of govt borrowing and spending. Govt borrowing and spending doesn't explain all of it or even most of it. I attribute the frustratingly low levels of capex (and hiring) to lousy animal spirits. There are many reasons for this including a harsh regulatory environment, widespread inconsistencies in corp law, etc etc. Perhaps that can all be ultimately attributed to the govt, but the actual levels of borrowing and spending don't explain the discrepancy. Matthew: I've long argued that the relative lack of corporate investment is symptomatic of a market that is still very cautious. Investors and businesses were so badly burned by the last recession that they have been very shy to take on risk. Confidence is returning and investment is improving, but it's still being held back, I believe, by an exceptionally onerous regulatory environment, a general anti-business sentiment that emanates from Washington, and the highest corporate tax rates in the developed world. More recently, there's been a return to very high marginal income tax rates for individual investors which has also stifled work and investment. If it weren't for all the fiscal and regulatory headwinds, the economy would be much stronger. And as this post points out, the government has been very busy wasting a good deal of all the economic resources that the private sector has managed to generate. So the problem is Washington. Gov't borrowing does not take money out of the financial system! In the medium to long term, the money spent by the Federal government ends up back in the banks in the form of deposits. Say the Federal Government finances some spending with debt. It sells 1000 dollars in bonds. 1000 'leaves' the banking system. Then the gov't spend the money. Now some agent in the private sector holds 1000 dollars, which he will probably redeposit into the banking system. The proportion of physical bills in circulation is actually falling in relation to the size of the economy for decades. In thirties roughly 1/3 of all money was in the form of bills and coins. Today, its less than 10 ten percent even when excluding the reserves created by QE. The conclusion is the the vast majority of people prefer to hold money in the form of banking deposit instead of physical notes! So borrowing removes only a tiny bit of money from the banking system, since it requires those who recieve gov't spend to stick it under a matress! But wait a minute, both long and short term interest rates have plummeted in the past six years, but the deficit exploded in 2009, and has come down substantially by remains at 4 percent of gdp. What gives? The Federal Reserve board, which this article seems to totally ignore. In addition to reducing the Fed Funds rate to zero, QE removed tons of long term assets (T-bonds and Agency MBS) from the market. This disrupted the normal mechanism by which government deficits raise long term rates. Investors essentially lost accesses to trillions of dollars worth of long term debt. Those who wished to hold this debt were forced to bid up the prices (and thus bid down yields) of the existing stock of Treasury debt. If the gov't had tried to balance its budget in 2009, even fewer Treasury bonds would have been available for investors, thus even lower interest rates. (It would have also included much higher tax rates and huge cuts in gov't spending) Eg, the Treasury yield probably would have fallen below 1 percent in 2012, 30 year fixed rate mortgages to well below 2 percent. On the other hand, an even more aggressive QE program could have achieved these targets. I implore you to realize the logical inconsistencies in your own arguments.